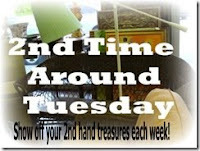 BARGAIN DECORATING WITH LAURIE: MY WHOLE HOUSE IS AT LEAST 2ND TIME AROUND! MY WHOLE HOUSE IS AT LEAST 2ND TIME AROUND! Diane at A Picture is Worth a 1000 Words, sponsors 2nd Time Around Tuesday. Since almost everything in my home is on at least it's second time around, it has been difficult for me to join second time around. I've walked around my house, trying to decide which of the second (third, fourth, etc.) time around items should be posted, and I usually just give up, because there are so many! I do want ya'll to know (and I'm very proud of this! ), my sofa was bought brand new at a Macy's Garage Sale a few years ago! Other than that, I can't think of much that isn't on at least it's second time around at my house! Oh, I do have something else, but it might also be considered to be on his sixth time around. When my husband came home from Viet Nam in 1971, I bought him a brand new recliner! It has been re stuffed twice and reupholstered six times since then, but he does love his "new" recliner! I decided to pick some "stuff" that I could share interesting stories about (at least, I think they are interesting, but I may think anything I have to say is interesting-after all, just look at how long my lead-in to this post is!). You are probably thinking this metal picnic basket isn't so interesting. We've seen several of these in Blogville. I bid on this at a local auction, but wasn't willing to pay a lot for it, so I lost the bid. Weeks after the auction, the man who had purchased it came by my office and gave it to me! The basket was filled with historical papers, and the papers were what he was bidding on, and he didn't even want the picnic basket! I offered to pay him what I had bid on the basket, but he declined, so I ended up getting it free--that's my kind of bargain, but what is even better, it was such a fun surprise! I don't think this cake stand is very old. I bought it at a tag sale several years ago, but several visitors asked about it when it was on my Easter tablescape posting. It is a Pfaltzgraff piece, and it may still be available. I haven't checked their website. I can't believe I'm posting this window curtain, and I really can't believe I'm going to tell ya'll what it is! This is just such a funny second time around that I am swallowing my pride and forcing myself to face the embarrassment of telling you what it is. When I cleaned out my family home, I found my prom dress from the year 1966! I started to throw it in the trash, but then I decided, with a little alteration, my grands could play dress up with it. They never got that chance though, since I needed a curtain for this powder room!! Yep! You read that right. The curtain in my powder room was made from the bottom of my 43 year old prom dress!! Don't you love the way my fathom date's hand is in the picture, but I decapitated him! Believe me, he deserved it! 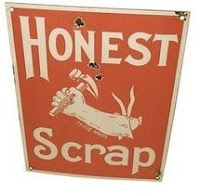 Laura, at Tomarie's Cabin, has awarded me the Honest Scrap Award. Have you ever been over to her blog to see her amazing "cabin"? If not, you'd better go now, because it is much more interesting than anything I can tell you about myself. I'm including this award in this post, because it is a second time around for me. The first time I received this award, I only listed five things about myself, and the award requires that we list ten. Since I tend to over share and tell all, I always feel like there is nothing you don't already know about me, so I'm going to tell you trivia about my Easter. Doesn't that sound sooo interesting? Thanks so much Laura for wanting to know anything else about me! This really isn't about me, but it is a warning! The Easter bunny brought baskets to my house for my grandchildren. He put "edible" grass in their baskets. You may want to talk to the Easter bunny before next year, because although this grass may be edible, I don't know who would eat it. It tastes terrible! More proof that I don't throw anything away, and that I don't mind being tacky with my decor! My friend, Susie, sent me a gift in this plastic bag, and I hung the bag in the window for Easter decor!! Although I do spoil my grandchildren, and I do allow them to do about what they want to at my house, I will make them sit for long periods of time to try to get a good picture of all four of them! My son-in-law is crazy! Since he's going bald at an early age, he used Easter basket grass (not the edible kind) for hair on Easter Sunday! I had 20 guests for Easter dinner. Normally, we have about 30 people for holiday dinners, but only 20 could be here for Easter dinner this year. Miss Janice, I know men are supposed to remove their hats at the dinner table, but apparently some of my guests don't know it! I'm joining Susan at A Southern Daydreamer Reads in the Spring Reading Challenge she has issued. I love to read, but lately, I'm reading all of your posts all of the time, so I haven't had a lot of time for my book reading. However, I am currently reading Mermaids in theBasement, a Michael Lee West novel, which is an absolutely wonderful read. I hope to also read the Story of Edgar Sawtelle by David Wroblewski, before the end of the challenge on June 20, but I'm not sure that I will complete it. If you'd like to join in this challenge, please stop by A Southern Daydreamer Reads and sign up. You are crazy!!! I have just had the best time reading your blog!!! I feel like I know you already just from your story!!! You remind me of one of my closest friends...she sees the humor in everything...I mean EVERYTHING!!! 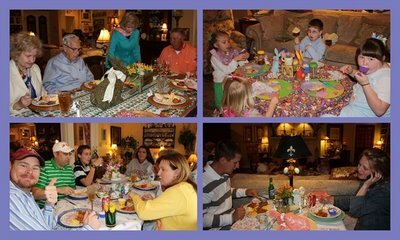 I wish I had been at your house for Easter...I'm sure everyone was thoroughly entertained!!! I love all your 2nd time around goodies and the stories that go with them!!! I can't wait to see what you write about next!!! Have a wonderful day...you crazy girl!!! I loved your sharing today especially the part about the prom curtains, that is such a sweet story. And the basket, was that not a lovely gesture. Love all your 2nd time arounds! What a great use of your prom dress! I love that the man gave you the basket after he got the part he really wanted! Wasn't that just a wonderful surprise! I'm so impressed that you say you "just" had 20 for dinner! I had 11 and 12 is all I can possibly "seat". If I ever had 30 --- well it would be standing room only! How clever and a little splash of memory every time you see it. Fun Easter times at your place. Laurie, I had the best time reading all of your post today. Yes, I had quite a few good laughs too. Your picnic basket story is a wonder and your prom dress and photo so cute. Even with your dates head cut off. You are so pretty in that pic. The rest of your Easter story is fun and I love the grass stories. Edible grass? ugh. Hair...Ugh. BIG smile. Thanks for sharing this post and the pictures. I enjoy seeing your table and your beautiful home, and your family. How sweet was that man to give you the basket? I bet you were surprised. And I loved that you made curtains out of your prom dress. got a chuckle out of that. Your s.i.l. was cute with his easter grass on his head. I am laughing about your SIL and his Easter grass hair. Looks like everyone had plenty to eat and a good family day. I think your idea of saving your prom dress and turning it into a curtain is a great idea. I wish I had saved mine from 67. Gosh they had such pretty dresses back then. I have fun memories of my prom, friends and my prom date:) My hair was piled so high that day that I could not get into the car without it hitting the roof. I need to find a photo so I can have a good laugh. Laurie, I love your 2nd time around treasures. The stories about the basket and prom dress really touched my heart. Your cakeplate is beautiful. I also loved the story about your recliner. If only everyone in this world was so frugal. The USA would not be going through what it is today. There is a big lesson in this wonderful post. Laurie, what a wonderful idea you had by making a curtain from you old prom dress! It looks beautiful and what a memory to see on a day to day basis. I enjoyed your post today, really nice. Oh how I wish I had saved a few of my homecoming and prom formals. My mother handmade each of them! I would tell her how I wanted them to look and she would somehow make it happen! Thanks for showing a close up of the beautiful cake stand!!! It must be so great to get all your family together Laurie, they are adorable and funny and what wonderful 2nd time arounds you have, what a nice man to give the basket to you and your prom dress looks gorgeous at the windows (I have decapatated a couple of exes from photo's too lol). Happy Tuesday, Kathy. That prom dress story is just too funny. I don't even remember what I wore to the prom much less still have the dress. Oh, and men are just too hard to separate from their caps. You and your son-in-law are a match! That was a sweet thing for the man (who bid on the papers) to do to give you the basket. I'm glad you had a good family Easter. Hi Laurie...I'm not supposed to be here...I'm on bloggy hiatus...but how could I resist coming by your place??? I also look around my "cottage" & think what do people think when I say this came from garage sales, thrift stores or discount stores? It's getting kind of embarrassing to admit that, but hey...I LOVE my used but not abused stuff...and I LOVE seeing your treasures too! HAHAHA Laurie...you're so cute! I LOVE the Prom Dress re-do as a curtain. And would WOULDN'T love the FREE picnic basket....a STEAL! And, your grand children are precious! Thanks for sharing your pictures. Hi Laurie! You know not everyone has seen all your 2nd time around stuff... I haven't! Gee, I'm gonna have to get in on this 2nd time around Tuesday thing, I've got a house full! LOL. I loved the part of your story how the guy brought you the basket(love it btw), it must have been meant to be yours! Your son in laws Easter grass hair made me just about made me fall off my chair! Bless his heart! My son keeps his hair cut in a butch haircut(is that what they still call it?) anyway, I'd love to see him with more hair, even some Easter grass hair would do, I don't care! you are so funny and such a neat person. I love what you did with your prom dress and I love that you decapitated your date..I bet we all have ex's like that. I'm kinda sad that I never saved a thing from my young years. I honestly dont know why. Your grandchildren are adorable. I've never heard of Edible Easter grass..
All your goodies are great especially the picnic basket! Your grandchildren are adorable! You are so funny Laurie! Loved seeing your second time around pretties! Cute grandkids too! Thanks so much for linking to 2nd Time Around! Your grandkids are adorable! And I loved your story about the prom! Love that picnic basket. I live in Texas and over here ya'll is a real word. I don't even know what proper word would replace it. Your blog is a delight to read. Laurie, I just love your blog! It looks like fun at Easter! I can't always get to the 'puter, so I'm always late! Yes Ya'll is a real word! I can't talk without using it! I worked with a girl, once, and she said "you guys" and made fun of my "ya'll" I told her we weren't all guys! well, he's not around anymore, so no need to mention names! I love that curtain story..one of my favs..I didn't know about the metal picnic basket..did you know the man that outbid you? I guess he knew you..
That metal picnic basket looks like real wicker, until I read it was metal I did not realize it. Do not worry, I have an eye appointment the first week in May. What a sweet man to give it to you, and for free! Laurie that is awesome that you are using your prom dress for a curtain. It is a great idea, and I think it looks good. You are so funny with the decapitation thing, I am still laughing about it!! Love your SIL's reuse of the Easter grass. That's hysterical. LOL.. love your SIL idea with the easter grass.. cute pic. Love that cake stand too. How did you do on your Spring Reading Challenge 2009? I have posted my list of what I read on my blog at http://asoutherndaydreamerreads.blogspot.com/ Post your results and link up your post with Mr Linky! I will post the Summer Reading Challenge 2009 on Friday, June 19, 2009…….. so get your list ready!